Vince Velasquez is changing. After his first two starts, he sported an otherworldly 38.6 K% but wasn’t able to translate stuff to results, running up a 9.00 ERA. Velasquez said he was “terrible“, and admitted he needed to change. The next two games he lived up to this promise, resembling a completely different pitcher. After combining for a mere 9 innings in his first two starts, Vinny V went at least 6 innings in each of his next two. His K% plummeted to 9.8%, but he more than halved his ERA to 4.38. Those are surface numbers, but what about him changed? The below graph sums it up. The above heatmap shows how Velasquez attacks hitters with a 0-0 count. The first two starts, he was nibbling. His first pitch strike percentage (F-Strike%) was 54.5% (well below the major league average of 61.4%). In his two starts since, he has attacked the zone, upping his F-Strike% to 66.70%. Overall, his Zone% (percent of times ball is thrown inside the strike zone) has remained about the same all year. This suggests that he tried to play “catch up” after falling behind the batter, putting more balls in the zone when the hitter had the advantage. Now, with Velasquez ahead in the count, he can get batters to chase outside the zone, where contact tends to be weaker. The stats back this up – his O-Contact rate is up 20 points, and his groundball rate is also up. While it’s encouraging to see these adjustments, it’s important to keep in mind – strike outs are a good thing. They keep the ball from being put into play, and a ball in play almost always has a chance of being a hit. Velasquez has benefited from luck during his better starts – his xBA has actually been higher as of late (0.291 vs. 0.229). If he keeps this “pitch to contact” approach up and his luck takes a turn for the worse, it could quickly get ugly. His velocity hasn’t taken a dip, so it wouldn’t be surprising if the strike out numbers pick back up. Hopefully the last couple of starts have given Velasquez some much needed confidence, and we’ll see him start to fold strike outs back into his game to become a more complete pitcher. Game 19: Win, 7-4. Vince Velasquez went 6.1 innings, the deepest he has all year. This could have been the big story of the game had the Phillies bats not woken up. The Phillies hit three homers, with the loudest being Maikel Franco’s grand slam. 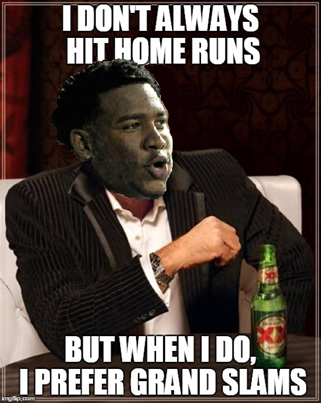 Franco has four home runs this year, two of which are grand slams. Allow me this moment to present you with a dated meme. Game 20: Win, 3-2. I don’t know how Jeremy Hellickson does it. He rarely strikes out batters – his K/9 is 3.30, lowest among ANY starter. Sometimes it’s hard to get context on stats – I say 3.30, but what does that mean? Unless you understand what an average K/9 is, I’m just saying numbers that don’t mean anything (like how in the NFL draft, they’re just saying names I’ve never heard of. They might as well be saying names like…Taco Charlton). One way I like to introduce context is by mentioning sample size – there are 105 pitchers in this sample. The average K/9 is 8.24. Hellickson’s 3.30 is the worst. The next worst K/9 isn’t even in the same area code (4.13, which sadly belongs to Cole Hamels). I’m not complaining about the results – he went 6 innings and only allowed one run. I’m just puzzled by the process. – The bullpen wasn’t charged with any earned runs (although Luis García did allow two inherited runners to score, which would prove to be the difference in this game). – Freddy Galvis tallied 2 more hits, extending his hit streak to 9 games. He’s hitting .350 during this streak, though it is a little worrisome that he hasn’t walked once in that span. Game 22: Loss, 5-6. West coast road trips are tough to follow. Night games regularly end after 1 A.M., and it’s not as if baseball is rife with exciting action to keep you awake. When I saw the score was 5-2, I went to sleep feeling confident the Phillies had assured themselves victory. Enter: Hector Neris. He faced a total of 5 batters in the 9th. He retired a total of 1. The worst case scenario became reality as back-to-back-to-back home runs were allowed to tie up the game. With Neris’s blown save, every Phillies reliever that’s been plugged into the closer’s role has blown a save. It’s like switching out your remote control’s batteries with some AA’s from a pile of used batteries – sometimes it’ll work, sometimes it won’t, but you don’t really have any other options available to you. Game 23: Loss, 3-5. An Odubel Herrera 2-run shot in the 9th masks how underpowered the offense was all game. There were 6 hits, 3 by Cameron Rupp. Nick Pivetta made his major league debut, and despite some initial shakiness (hits allowed to the first three batters he faced) he settled in nicely. His fastball averaged 94.5 MPH and helped him along to a respectable final line – 5 IP, 5 K, 1 BB, and 2 ER. Getting Papelbon out of Philly was good enough – getting a decent pitcher out of the deal is the icing on the cake. Eric Thames of the Brewers played the last three seasons in Korea, where his nickname was simply “God”. He returned to the MLB this year and pitchers are feeling his wrath – he leads baseball with 11 home runs. Fangraphs recently wrote an article on how well he’s doing. The article is good, but the first comment is the funniest thing I’ve seen all week. The Yankees’ Aaron Judge is a hulking behemoth of a man. He is the author of the hardest hit line drive of the year, which you could debate is attempted murder. After a hot weekend, Judge is second in baseball with 10 homers. The Mariners’ Boog Powell made his major league debut this weekend, kind of. He was announced as the batter and was immediately pinch hit for after a pitching change. This is the 24th time this has happened. Next up, the Phillies have four games against the defending World Series champions before returning to Philadelphia. Let’s hope Velasquez can stop the bleeding tonight. It won’t be easy. < Previous Week 3 Recap: .500! .500!